If you’ve read the little about me blurb on the side, you know I own a carpet cleaning company. I have them come out and clean my carpets every few months. Just recently, I had them come out and I had a chance to take some pictures and ask the technician some of his secrets. Robert, the technician, has been with my company for eight years, perfected his technique in his own home, and takes great pride in his work. 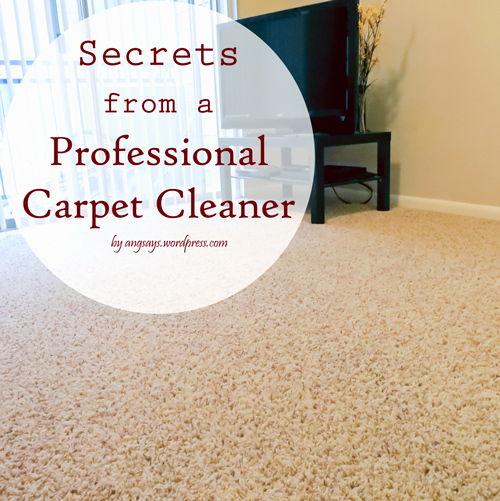 During the cleaning, Robert shared some of his secrets to keeping the carpet cleaner and looking brand new. Some of them I knew, but some were a complete surprise to me. It was so interesting to hear what he had to say after being in the industry for nearly a decade. If you’re cooking in the kitchen, smoke goes up and oil comes down. That oil is tracked around the house from the bottom of your shoes or feet. However, most of the grease and oil becomes stuck in the first strip of carpet you wipe your feet on. All of the grease, crumbs and dirt from the kitchen is now trapped in the carpet, but your feet are cleaner. Put a rug down in that spot where you like to wipe your feet and save that bit of carpet from looking permanently stained. You can extend the life of your carpet by keeping up with reapplying carpet protector. Spills and stains will have a harder time setting and come out easier with a carpet protectant. Carpets are a big investment and you can make them last by maintaining them properly. Your carpets will always look better if you keep up with cleaning and protecting the carpet. As carpet ages and becomes damaged, the fibers fray and separate. This one is obvious but most of the dirt in your home comes from outside. Think about it, you walk outside, around the grocery store where there are public bathrooms, restaurants where food is spilled, shopping malls, many different public places with everyone else’s dirt and germs. Get a rug or rack where you and your guest can store your shoes by the door so you are not tracking all of that dirt in and around your home. There was a chocolate stain on the couch (I plead the fifth) that didn’t come out in the wash. Robert went over sprayed with his stain remover, worked it in and let the cleaner sit. By the end of the cleaning, the stain was gone. Sometimes we get so obsessed with getting stains out, we forget to let the stain remover do its job and we scrub profusely. I see a stain and want it out now. By letting the remover sit on the stain, break it down, you don’t have to scrub and potentially damage the fibers. Blot up as much of the stain as you can then saturate the stain with remover, let it work and blot it up. Thanks Captain Obvious, we know this one. But do you? With all of the dirt that is tracked into homes, vacuuming removes most of it. Homes with a lot of foot traffic should be vacuumed 2-3 times a week. The most damaging thing to your carpets is not all of the foot traffic but the dirt rubbing against the carpet fibers. 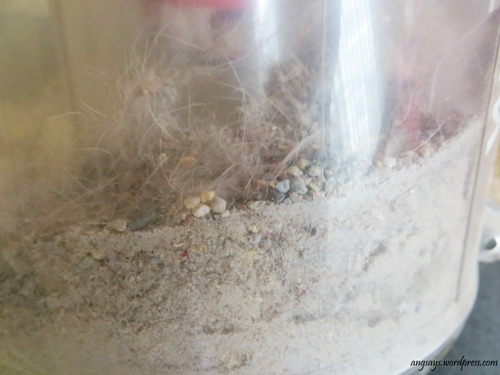 Look at the photo below and tell me that the little rocks in the vacuum won’t do serious damage. Those little rocks can wedged themselves between carpet fibers, tearing them apart. Yes that came out of my carpet along with all of that sand and pet hair. I may not have been as diligent as I should have been lately in vacuuming. I promise to do better, probably because my OCDness in cleaning is freaking out. 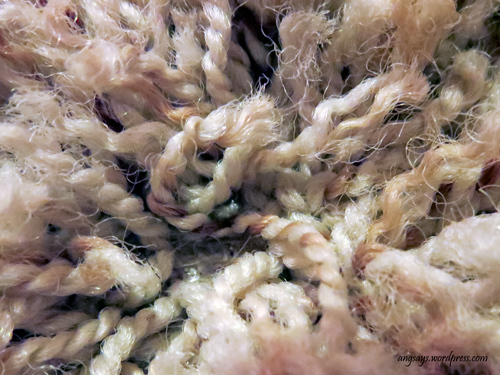 As we walk, dance and run on the carpet, the fibers twist and turn against dirt, in my case rocks, causing the fibers to break apart and fray. Vacuum and your carpets will thank you by looking amazing. Chatting with Robert was so much fun. He had different stories of people and their first time getting the carpets cleaned and people whose homes he’s been cleaning for years. Robert can walk into a home and tell where a man sits and where a woman sits just by looking at the traffic patterns in the carpets. I loved that he took pride in his work and treated my carpet like his own. I’m also super grateful that he took the time to share his carpet cleaning secrets with me. The EPA recommends that you get your carpets cleaned 1-2 times a year and more often if you have children, or pets. Next time you have your carpets professionally cleaned, ask the technician for some personalized tips you can take to keep your carpet cleaner. Great advice that I need to take 🙂 New follower – Love all of your tips and looking forward to reading more. Thanks for posting. I didn’t know that I should be having carpets cleaned 1-2 times per year! There are some great tips here. I’m visiting from 36th Avenue. Thanks! I’m so happy you stopped by. Yes, carpets do need at least a yearly cleaning. If you think about it with all of the foot traffic your home has, all of the dirt and germs being tracked in, it’s gross. Anyhoo, I’m glad you like my site, I just stopped by yours. Thanks for the great tips. Found you over on The Real Housewives of Riverton’s linky party. Love these tips! I have to keep this carpet in good condition since we just replaced it! Thanks! I would say make sure you keep up with the carpet protectant, that is what will really keep your carpets looking beautiful. Great tip, it makes total sense too. Thanks so much for stopping by! Thanks for the tips. I am having my carpets cleaned today!! I was told by the person who laid our new carpet 2 years ago not to vacuum so often. We have 3 dogs and I tended to vacuum every other day. (OCD you think?) I will go back to vacuuming as often as I see fit!! Placing a rug at the threshold where you walk from hardwood to carpeting does keep the carpet clean but is not safe for people who have a disability or the elderly. Just saying as a daughter of a senior. Little rocks and sand huh? I guess I should vacuum my carpets as well. I have forgotten to do it for the past four weeks. Taking off your shoes at the door is very good idea;however,one should either put on another pair of shoes that have not tracked in mud or slippers. We had a rug installer tell us that the worst is barefoot because you are transferring body oils and perspiration to the carpet which in turn dirt adheres to. Also, if you get a good vacuum cleaner, you will be surprised how much dirt and dust gets picked up in say a weeks time. you keep mentioning carpet protector .I have 3 dogs and a lot of foot traffic all over the carpet what kind of carpet protector do you suggest ? also can you tell me what to use when cleaning my carpet that will not only get out dog stains but the smell . something I can mix in with the cleaning soap that will also get that nasty urine smell out. my son is a mechanic so we also have grease on the carpet , can you help ? My little niece and nephew did a number on my carpets over the Thanksgiving holiday. It is good to know that I should let a stain remover sink into my carpet. Personally, I would want to get a professional to remove some of my new carpet stains.